Surya Savarnika Manavu Ashramam Go-Sala Starts under Go Samrakshana Activity . In the month of January first week it was happen to read an Article which has been published under the Style in Srigeri Vidya Bharati Foundation USA's Journal . This Article very much impressed me. So I thought to start a Go Sala at our ashramam as advice given in Said Article. Immediately we started A Go Sala under the name of Surya Savarnika Manavu Ashramam Go Sala at our Ashramam. On Kanuma Day i.e 16-01-2016, we did Go puja at our Go Sala and given Fruits and green feed to the Cows. This Event given us a very divine pleasure. We wants to continue the Go Samrakshana i.e Cow protection activities as its a tradition in Hindu Dharma. Related photos are given below. So people who are interested in Go Samrakshana as well as Hindu Dharma Samrakshana may join your hands with us by giving Financial and physical Support , for the improvement of above said Go Sala . The above mentioned Article is as follows. In the Vedic tradition, a cow is looked upon as Goddess of wealth. Wealth includes spiritual well-being, physical well being, and economic well being. The Vedic view is that safeguarding and protecting a cow will confer all three types of well-being. But unfortunately, as a modern society, we have failed miserably to understand the equation and derailed from this prescription. In this essay, we examine various perspectives regarding the value and importance of cow protection as our dharma. From insects to elephants, every being is sacred in the Vedic tradition [1, 2]. Some animals are accorded the status of being the vehicles of the Hindu deities (ex: bull for Lord Shiva, peacock for Lord Muruga etc). Others, like the cow are associated with divinity. The elephant faced Lord Ganesha, is an important deity looked upon as the remover of obstacles in any human endeavour. Shoulders symbolize agni devatā, the god of fire. Lord Brahma gave life to priests and cows at the same time so that the priests would recite from the religious scriptures while cows would provide ghee (clarified butter) for offering in rituals. Lord Krishna, one of the avatarsin Hinduism, appeared as a cowherd, and is often described as “Gopāla” (the one who protects the cows), or “Govinda” (one who is the lord of the cows). Many other Hindu scriptures identify the cow as the “mother” of all civilization, and its milk nurturing the population. In Mahābhārata, Bhīṣma states that the cow acts as a surrogate mother by providing milk to human beings for lifetime. Many Purāṇas state that the gift of cow(s) in rituals is the greatest of all gifts. The Vedas point out all the practical help and benefits that cows give to humans, and thereby, instruct human beingsto protect cows. With the help of cows, mankind is freed from much of the mundane farm life work (ploughing land, procuring dairy for daily intake, preparing fertilizers), and thereby afforded time for spiritual pursuits . All the yajñas (ritualistic offerings) prescribed in the Vedic tradition are meant for physical or material or spiritual well-being of self and the society. None of the yajñas can be performed without ghee and dried cow dung. It becomes imperative that cows should be protected to carry out these rituals, and in turn, obtain the three fold benefits. Based on economic reasons, the sacredness and protection of cows is very pertinent. . In the Vedic times, cattle represented wealth for the predominantly pastoral communities that were prevalent then. The five key “products” of the cow used in daily life are milk, curds, ghee, butter, urine and dung; Cows provide milk that serves as additional nutrition to adults and children. The by-products of milk such as yogurt, buttermilk, butter and ghee are an integral part of people’s daily diet in India. Cow dung that has been scientifically proven to have antiseptic value , and is used to clean house floors and walls in rural areas. By having a cow in every household, the family’s needs for milk and the resulting byproducts can be easily met without reliance on external sources. Biogas plants are an eco-friendly affordable technology that helps to safeguard local forest resources by reducing firewood consumption for fuel in rural areas. Biogas can also reduce the consumption of kerosene which is used as fuel in urban and rural areas. Biogas is a method of producing methane gas from organic matter via natural bacterial action. Cow dung serves as the best feed for biogas plants, and the resulting biogas can be used for cooking. The residues can be used as agricultural fertilizer, which also helps in minimizing the use of artificial chemical fertilizers . In India, the total dung production is estimated at 659 tons annually. There are only 22 million family type biogas plants in India utilizing only 22 tons of cow dung annually. By installing more biogas plants and utilizing all the available cow dung, India can be self-sufficient in eco-friendly energy, and this creates economic advantages. To have a continuous supply of cow dung, the protection of cows is imperative. More Gośālās (Cow Sanctuaries) should be built and money must be invested in proper running and maintenance of these sanctuaries. Appropriate economic models of the dairy projects should be developed with the aim to obtain revenue from the sale of milk and other products from these cow sanctuaries. The revenue obtained from the sales can be again used for the protection of cows. This will demonstrate the importance of cow protection not only for religious purposes but for economic prosperity as well . Using the five products namely milk, curds, ghee, cow urine and cow dung, a very effective body cleansing medicine known as Pañcagavyam is made. Regular consumption of Pañcagavyam helps in removal of toxins from the body and further strengthens the immune system . Cow milk is the next best thing to breast milk for a newborn. Cow milk nourishes the body tissues and improves intelligence and strength. Curd from cow’s milk is an effective medicine for controlling diarrhoea and in reducing the irritability of the bladder. Cow ghee improves digestive fire, intelligence, memory, skin softness and eye strength. Cow urine provides effective remedy for various skin diseases, digestion issues and urinary infection. Cow dung provides increased resistance to illnesses and also has antiseptic properties. Use of cow dung is very effective in respiratory ailments and strengthening of muscles. From all the above benefits, it is very clear that we also have a tangible benefit (physical well being) by protecting cows. All the health benefits of cow products discussed in this section should ideally be enjoyed provided that the cattle are being raised and treated in an ethical and humane way. If not, efforts should be made to derive the health benefits (that dairy products give) from non-dairy products. It is also encouraging to note that there are functioning gośālās in India that follow a strict ethical and humane treatment to cattle. These gośālās also ensure availability of various dairy products to ordinary citizens at a reasonable price. The Hindu religion strongly values the ideals of compassion and non-violence. To a Hindu, the cow symbolizes all other creatures. The cow represents life, and the sustenance of life. Unfortunately, ~500 cows and calves are slaughtered every minute all around the world . At this rate of slaughter, it is limiting to just be content by being a vegetarian. Instead, we should take proactive steps to ensure that we work towards minimizing or eliminating the slaughter of cows. (1).Minimize the use of milk at the personal level and also as a community. Never in human history have people consumed such large volume of milk and milk products. Milk and milk products were more often used for their medicinal benefits and only when there is a medical need. Present-day factory farms inflict massive, large-scale suffering of a magnitude never before seen in dairy practices. Present day practices have almost removed the good qualities in milk by adding hormones and artificial vitamins. At the personal level, one can start by reducing the consumption of food items such as paneer, ice-creams etc. that are prepared using huge gallons of milk. At the community level, devotees should support the noble initiatives by temples to use the milk from their own gośālā for abhiśekhams. As an example, Sringeri Vidya Bharati Foundation Temple, Stroudsburg PA and Sri Guruvayoorappan Temple, Morganville, NJ have their own gośālā to procure milk for the temple use. (2). To the extent possible, avoid using products that may directly or indirectly involve violence to cattle. Vegetarianism is not limited only to food items but it encompasses all consumables and materials that we use to sustain in this world. By using leather products, one is unquestionably patronizing the slaughterhouse and meat packing industry (skin is the most significant by product of the meatpacking industry). With the advancement in science and technology, there are various alternatives for the most commonly used leather products (shoes, handbags, belts, wallets, etc). A huge selection of non-leather products are available in the market and all one has to look for is for the label that says “All Man-Made Materials” or “100% Synthetic.” It takes only a willingness and conscious effort to look for products that are not made from leather, and consequently, not contributing to animal cruelty. (3). Male calves are not useful for dairy industry but instead are raised for veal (meat of young cattle) in individual crates that are no more than 30 inches wide and 72 inches long . These crates are designed to avoid normal muscle growth in order to produce tender “gourmet” veal. By buying dairy products (organic or non-organic), our money goes to an industry that supports veal production. Served in diners and restaurants, veal is particularly prominent in Italian cuisine. By consuming such cuisine, one may unwittingly be supporting the veal industry. (4).Support (financial help and physical service) a Gośālā in the place where you live. If there is none in your area, try to start one at a small level by joining hands with like-minded people. (5). Support all projects or small scale industries that are striving to bring out products from cow’s milk, urine and dung. These products are being created for health benefits as well as the nurturance of an eco friendly living environment. 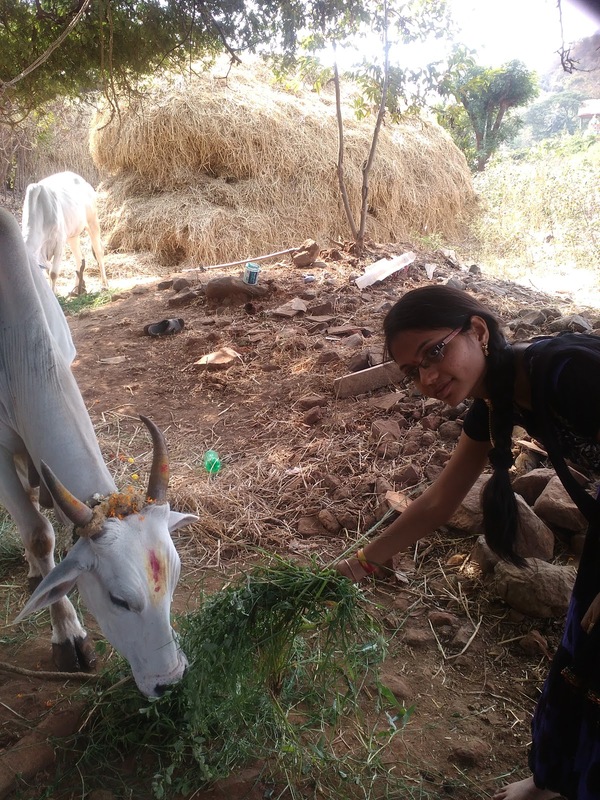 ( See this link http://svbf.org/newsletters/year-2015/cow-protection-a-means-to-spiritual-physical-and-economic-well-being/). devotees and interested persons may send cheque or make on line Transfer by using the above said Bank Account details.